This event signifies that the user process is reading buffers into the SGA buffer cache and is waiting for a physical I/O call to return. A db file scattered read issues a scattered read to read the data into multiple discontinuous memory locations. A scattered read is usually a multiblock read. It can occur for a fast full scan (of an index) in addition to a full table scan. The db file scattered read wait event identifies that a full scan is occurring. 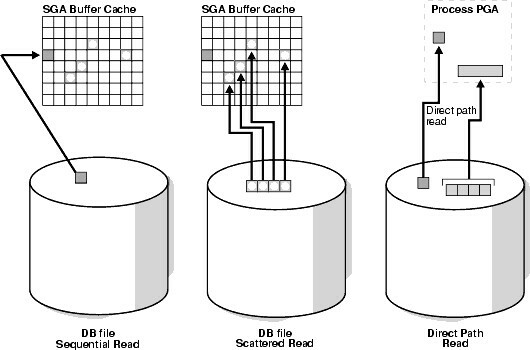 When performing a full scan into the buffer cache, the blocks read are read into memory locations that are not physically adjacent to each other. Such reads are called scattered read calls, because the blocks are scattered throughout memory. Multiblock (up to DB_FILE_MULTIBLOCK_READ_COUNT blocks) reads due to full scans into the buffer cache show up as waits for 'db file scattered read'. or db file scattered read waits on an operational (OLTP) system that should be doing small indexed accesses. Bad statistics can also lead to bad explain plan with this kind of event.